54 year old Sherry Yang bounds ahead, eager to to show us the city of Du Jiang Yan. She is excited but also nervous about what she’ll find. We head for the river and up what used to be a scenic waterside pathway. Instead we find ourselves walking through the middle of people’s makeshift homes. We weave our way around the tables, beds and even the odd TV that make these tarps and tents a fraction more comfortable. Between the tents we come upon what had been these people’s houses. Ancient beams criss cross laneways, and living rooms lay exposed, walls appearing as though they have been peeled back. Yang confidently leads us through the maze and people greet us good naturedly as we pass through their lives. Some, even looking up from the kitchen table to offer us a bite. They have nothing, and they are offering me their food. 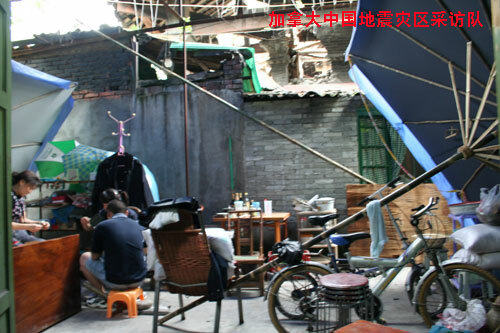 These are the people of Du Jiang Yan. I have no time to ponder this as Yang’s lean frame disappears around another corner. Although she is from Toronto her family has a long history here and she is anxious to see if one particular bridge has survived the quake. From a distance I see what appears to be a magnificent temple, but soon realize it is the imposing roof of the South Bridge. The structure still stands, its wooden planks busy with pedestrians, much as I imagine it would have been when it was built a thousand years ago. But its much more than history that connects Yang to it. “In the middle, the two words were written by my father,” she explains, pointing to two large gold coloured Chinese characters on the roof of the bridge. Her father was an important official here, as well as a talented artist. He died last year at the age of 96. Yang looks again at the painting, stops and dissolves in tears, “It’s still there, that’s why I feel so emotional”. Over the past few days, Yang has had a lot to absorb. 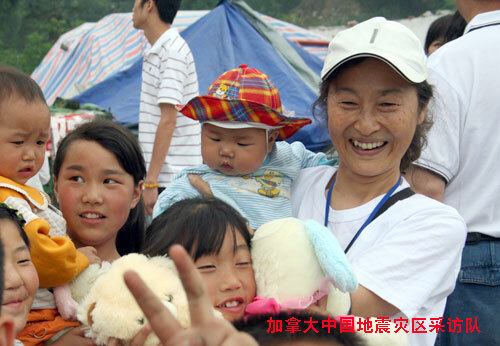 She is a member of the “Sichuan Earthquake Relief Committee”. A Toronto based group which managed to raise half a million dollars for the quake ravaged area. She has had a chance to see exactly how the money is being spent, most of it on clean water. “People get fresh water for drinking and its very important to me that they get that” she explains. She says is proud of Toronto’s efforts to help, and is also proud of this city, “The people here, they are still living, they are still trying to live normally. We can tell they try to help themselves.” She pauses for another moment to collect herself, takes a deep breath, then bounds forward again, eager to show us more. 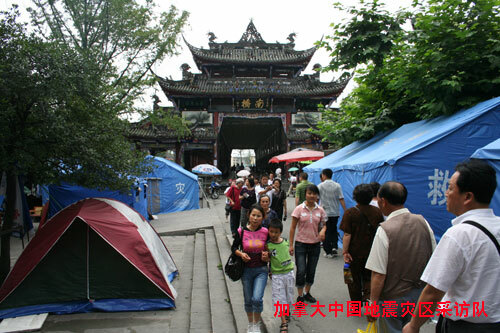 South Bridge with tent homes, in Du Jiang Yan. Home in Di Jiang Yan. Sherry Yang with boy at Red Cross water station. 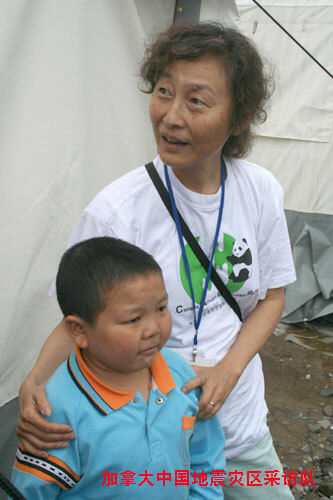 Sherry Yang with children living in tent village.